On-air challenge: Every answer this week is the name of a newspaper comic strip or cartoon, past or present. Identify the funnies from their anagrams. For example: GOO + P --> POGO. Last week's challenge from Mike Hinterberg of Loveland, Colo.: Name a creature in nine letters. The name contains a T. Drop the T, and the remaining letters can be rearranged to spell two related modes of transportation. What are they? Answer: Butterfly --> Lyft, Uber. If you know the answer to next week's challenge, submit it here. Listeners who submit correct answers win a chance to play the on-air puzzle. Important: Include a phone number where we can reach you Thursday, May 26, at 3 p.m. ET. I'm back in the studio after a couple weeks away and so is a special guest, so let's get right to it and play the puzzle. MARTIN: Of course I'm here with Will Shortz. He's puzzle editor of The New York Times and WEEKEND EDITION's puzzle master. We usually do this remotely. Will is actually in D.C., in the studio here with me. Hi, Will. WILL SHORTZ, BYLINE: Hey, Rachel. MARTIN: We're so happy that you're here. This is a big deal. You're here not just to visit us, but also because you're giving a commencement address, right? 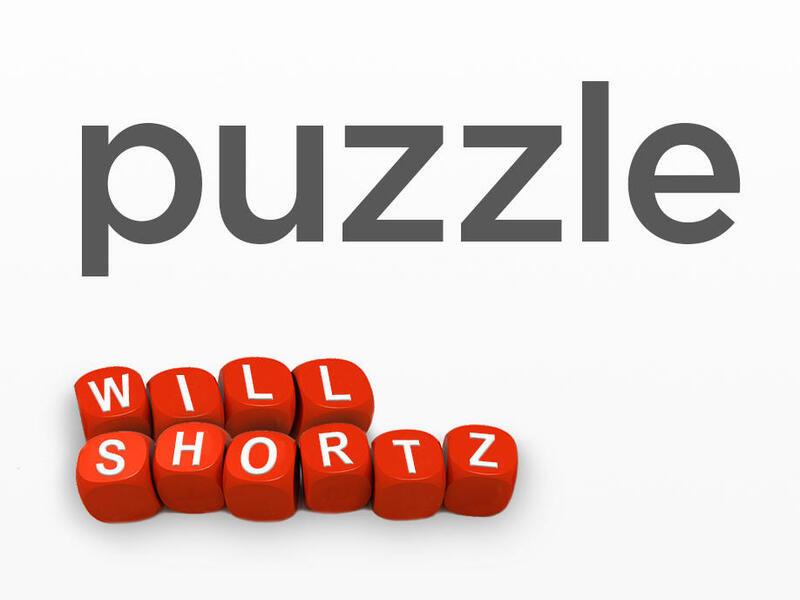 SHORTZ: ...Because most of my speech is an interactive quiz. MARTIN: An interactive quiz? So people are actually going to shout out answers from the audience? MARTIN: Cool. OK. Well, remind us of last week's challenge. SHORTZ: Yes, it came from listener Mike Hinterberg of Loveland, Colo. I said, name a creature in nine letters. The name contains a T. I said, drop the T and the remaining letters can be rearranged to spell two related modes of transportation. What are they? Well, it was a tough puzzle. The answer was butterfly. Drop one of the Ts and you can rearrange the letters that remain to make Uber and Lyft, L-Y-F-T.
MARTIN: All right, this was kind of a hard one. We got just over a hundred correct answers, and our randomly selected winner this week is Manfred Hofer of Los Angeles, Calif. He's on the line now. Hey, Manfred, well done. HOFER: Actually (laughter), I have a bit of an unfair advantage. I actually came up with the idea for this puzzle myself a few weeks ago. HOFER: I am totally serious. I don't know why I was thinking of butterfly - and I realized, you know, I could break that down into Uber and Lyft with a T left over. HOFER: Hey, this would make a great puzzle for Will Shortz. MARTIN: (Laughter) Are you kidding? That's crazy. HOFER: No, I'm totally serious (laughter). SHORTZ: And you know he's going to be good. MARTIN: Yeah. Yeah, totally. Have you been playing the puzzle a long time? Sounds like you have. HOFER: I have been listening and playing along, but I've never actually entered (laughter). MARTIN: Oh, that's awesome. OK, well, let's play the puzzle, Will. SHORTZ: All right, Manfred and Rachel, every answer today is the name of a newspaper comic strip or cartoon, past or present. SHORTZ: Identify the funnies from their anagrams. For example, if I said goo, G-O-O, plus P as in Peter, you would say "Pogo." SHORTZ: Number one is chat, C-H-A-T, plus Y.
SHORTZ: "Cathy" is right. Number two is cyan, C-Y-A-N, plus N.
SHORTZ: That's it. How about chair, C-H-A-I-R, plus E? It's a boy's name. HOFER: I was going to say Charlie, but there's an L there. Richie? SHORTZ: No, but it ends in C-H-I-E.
SHORTZ: "Archie" is it. There you go. Unseat, U-N-S-E-A-T, plus P as in Peter. SHORTZ: "Peanuts," yeah. Fragile, F-R-A-G-I-L-E, plus D as in dog. HOFER: D as in dog? SHORTZ: Yeah, fragile plus D.
SHORTZ: "Garfield," yes. Liberal, L-I-B-E-R-A-L, plus N as in Nancy. It's a two-word answer, three-five - three-letter word and a five-letter word. SHORTZ: ...Liberal plus N. And here's a hint - the three letter word has an apostrophe in it. SHORTZ: "Li'l Abner" is it. And here's your last one - headfirst, H-E-A-D-F-I-R-S-T, plus E. It's a three-word answer, three-three-four. SHORTZ: Can you guess what the first three-letter word is? HOFER: (Laughter) The sad fire. MARTIN: So what do we have left? A, D, F, I, R, S, E. That's what we have left. SHORTZ: And then did you say a D? There should be a D in there somewhere in there, too. HOFER: It's not the sad fire. SHORTZ: No, it's not the sad fire. SHORTZ: ...F is right. F is right, yeah. HOFER: ...Oh, why can't I get this? SHORTZ: "The Far Side" is it. HOFER: That's one I should have known (laughter). MARTIN: Oh man, that was great. Manfred, well done. MARTIN: For playing the puzzle today, you get a WEEKEND EDITION lapel pin and puzzle books and games. You can read all about your prizes at npr.org/puzzle. And before we let you go, Manfred, where do you hear us? MARTIN: Nice. Manfred Hofer of LA. Manfred, thanks so much for playing the puzzle. HOFER: Thank you very much. It was such a pleasure. MARTIN: All right, Will, what's up for next week? SHORTZ: Yes, name a common household item in six letters, change the middle two letters to a P, as in Peter, and you'll get the five-letter last name of a famous person who professionally used that item. What's the item, and who's the person? So again, a common household item, six letters, change the middle two letters to a P and you'll get the five-letter last name of a famous person who professionally used that item. What's the item and who's the person? MARTIN: All right, you know what to do. When you've got the answer, go to npr.org/puzzle, click on the submit your answer link, just one entry per person, please. And our deadline for those entries is Thursday, May 26 at 3 p.m. Eastern time. Don't forget to include a phone number where we can reach you at about that time. And if you're the winner, then we call you and then you get to play on the air with the puzzle editor of The New York Times. And he is WEEKEND EDITION's puzzle master, Will Shortz. Thanks so much, Will.